As we noted in our previous post, Cypriot President Nicos Anastasiades had sort of spoiled the surprise. Anyway, now it's official: Polish Prime Minister Donald Tusk has been appointed new European Council President, and Italian Foreign Minister Federica Mogherini will succeed Baroness Ashton as the EU's foreign policy chief (aka High Representative for Foreign Affairs). That said, Tusk is also likely to oppose fundamental changes to EU rules on free movement; although he did say that so-called 'welfare abuse' can be addressed, as we've noted, for many the debate has moved on from the issue of 'fairness' to that of 'volume', something Cameron will be under huge pressure to place at the centre of his potential renegotiation. In the more immediate future, Cameron's early support for Tusk as new European Council President could increase the UK's chances of securing a big portfolio in the new European Commission. Significantly, it has been confirmed that Tusk will also chair the summits of eurozone leaders - despite coming from a non-euro country. This looks like a big concession made, in particular, by French President François Hollande - who was reportedly sceptical of such an arrangement. Perhaps Hollande hopes that giving ground on this point can help him secure the key post of European Commissioner for Economic and Monetary Affairs for his former Finance Minister Pierre Moscovici. The resistance to Mogherini, put up by Eastern EU member states over the past few weeks, has clearly been appeased by Tusk's appointment as new European Council President. 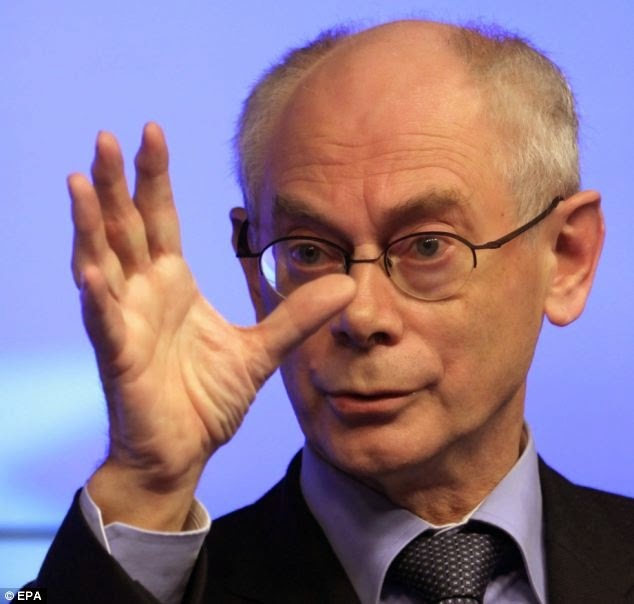 It was noteworthy that Herman Van Rompuy stressed that Tusk and Mogherini would "work closely together to secure Europe's interests and values". Italian Prime Minister Matteo Renzi, who has invested a great deal of political capital on Mogherini, seems to have achieved what he was looking for: a diplomatic victory in Brussels to sell to the electorate once back in Italy - where the big reforms are not going forward as fast as announcements, and the economic situation shows no signs of improvement. With the country in recession and deflation, it remains to be seen how much Italian voters will be impressed. As we noted in our recent flash analysis, the role of High Representative is less crucial from the UK's point of view - as foreign policy remains primarily a national competence, with every EU member state having a veto. However, in light of the various geopolitical challenges facing the EU (and its neighbourhood), it is possible that Mogherini will play a greater - or at least more visible - role than her predecessor. "I understand that Tusk it's OK": Has the Cypriot President just spoiled it all? As we wrote in our round-up of EU leaders' doorsteps, Polish Prime Minister Donald Tusk is the favourite for the European Council President post but it was not yet a done deal. However, have we just inadvertently had confirmation that Tusk has landed the job? "We have news, I understand that Donald [Tusk] it's okay." That sounds like a bit of a spoiler, but we will keep following the summit and provide you with real-time updates on Twitter just in case there are any last minute surprises. EU leaders have all arrived in Brussels for today's summit. There are two big issues on the table: the appointments of the next European Council President and High Representative for Foreign Affairs; and the worsening situation in Ukraine (although the situation in the Middle East is also bound to come up). #Hollande thinks #Mogherini will be new High Rep, says "consensus solution" needed for new #EUCO President. He didn't name Polish PM #Tusk. Belgian PM Di Rupo says there are "several quality candidates" for #EUCO President. Mogherini has travelled to Brussels herself, and has met European Commission President-elect Jean-Claude Juncker - possibly a further sign her appointment is drawing closer. Tusk walked into the European Council building without saying a word, although reportedly with a smile on his face. And that's all for the moment. The summit is under way, and we will continue monitoring it. Follow us on Twitter @OpenEurope, @pswidlicki and @LondonerVince for real-time updates and analysis. Council Presidency - who will succeed him? As we laid out in our flash analysis yesterday, the outcome of tomorrow's EU 'top jobs' summit is looking increasingly predictable. Italian Prime Minister Matteo Renzi's efforts to force his Foreign Minister Federica Mogherini into the High Representative post look set to pay off (with Merkel deciding to keep her powder dry for the almighty scrap over the Economic and Monetary Affairs portfolio). Spanish Europe Minister Íñigo Méndez de Vigo this morning tweeted that Mogherini is the "clear favourite" to take over from Baroness Ashton. Hence, the flip side of the High Representative post going to the relatively dovish Italy seems to be the European Council President post going to a Central and Eastern European member state, with Poland's Donald Tusk (who has been officially endorsed by David Cameron), Latvia's Valdis Dombrovskis and Estonia's Andrus Ansip all in the mix. Tusk himself is staying tight-lipped, with the Polish government's spokeswoman this morning claiming that he had not yet made up his mind - a notable change of emphasis from Tusk's previous outright denials. Somewhat amusingly, Gazeta Wyborcza reports that the person responsible for potentially changing the Polish Prime Minister's mind is...his wife. Mrs Tusk allegedly thinks the post will mean "[more] prestige, [more] money and less pressure." Of course, with it being the EU, a last minute surprise cannot be completely ruled out, and as in 2009 we could end up with some completely unexpected names that had not been on the radar. However, given the severity of developments in Ukraine - and also in the Middle East - there will be pressure on EU leaders to take concrete measures instead of wrangling about personalities. EU leaders will also debate the allocation of key posts within the Commission, and Cameron will be pushing for the UK nominee Lord Hill to get an important economic post like internal market or competition, although these are not set to be announced at least until September 8th. To follow tomorrow's developments live make sure to stay tuned to @OpenEurope, @LondonerVince and @pswidlicki. Douglas Carswell was until this morning the Conservative MP for Clacton on the Essex coast. He has now resigned from the Conservative party, joined UKIP, and says he will resign his seat in order to contest it as a UKIP candidate in the resulting by-election. His resignation is not a total surprise as it follows a long period as a critic of the Conservative Party's direction and of David Cameron in particular. Carswell's criticisms are not limited to the Conservatives and not limited to Europe - he has developed a critique of British politics generally - but Europe is among his key complaints. In his resignation speech Carswell questioned David Cameron's commitment to EU reform accusing him of aiming to do the bear minimum necessary in order to secure an 'in' vote, while Carswell's view of a satisfactory renegotiation seems more akin to associate membership. He says this is a classic example the political class not being straight with the electorate and his reason to quit. The Conservative leadership for their part will feel aggrieved that having set out a 2017 referendum on EU membership they are rewarded with Carswell's 'ingratitude' - recriminations will run and run. Carswell prides himself on having a large following locally and Clacton itself, it has been argued, is the "number one most demographically favourable seat in the country for UKIP" according to Goodwin and Ford's Revolt on the Right. He therefore has a fighting chance of winning the seat. So what could happen? Firstly, it is unclear whether the Conservatives will allow the by election to go ahead - they have to approve the writ being moved and could argue that with an election already scheduled the people of Clacton can wait until May 2015. However, if it is called, the stakes could not be higher. If Carswell wins, UKIP can then tell voters everywhere that voting UKIP gives a genuine change of producing an MP. This could be catastrophic for the Conservatives and may deprive them of a number of seats, to other parties mostly, but conceivably to UKIP as well. 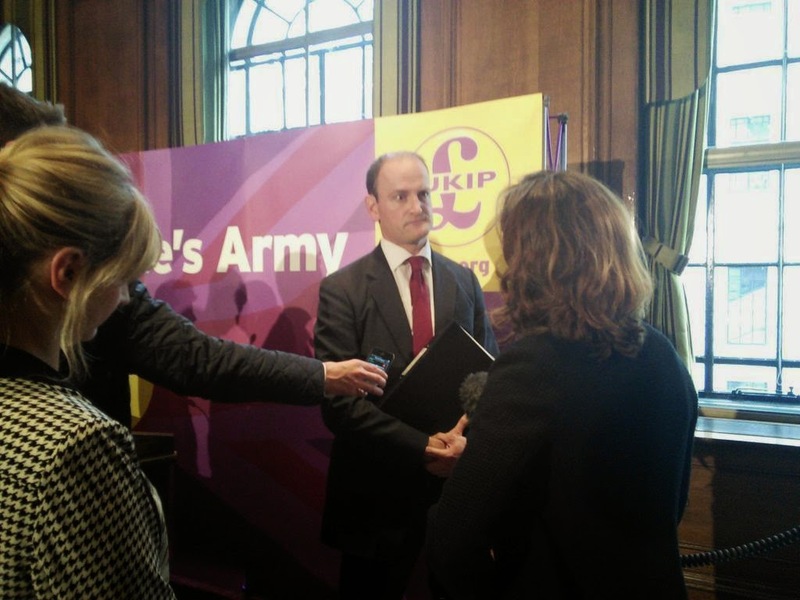 If Carswell loses, the result will be equally disastrous for UKIP. The Conservatives can use it to show that even in one of UKIP's best constituencies with one of their biggest names they can not win a seat - so why waste your vote in May 2015 will be the refrain. UKIP does not just take votes from the Conservatives, they also gain a lot of their support from Labour, non-voters and even the Lib Dems. However, Carswell by taking on his former party will polarise the debate again into Conservatives/UKIP, something perhaps both parties may wish to avoid. This could be a foretaste of 2015. In any case, a Labour victory would most likely mean that the In/Out EU referendum Cameron has promised won't happen, as Ed Miliband looks determined to stick to his promise not to offer a straight vote. It would be a tremendous irony if Carswell's defection - Carswell, remember, having campaigned tirelessly for an EU referendum and more direct democracy - would in the end deny the UK public an EU referendum and more direct democracy. 28,000 Romanian and Bulgarian citizens immigrated to the UK in the year ending March 2014, a significant increase from 12,000 in the previous 12 months. This contributed to overall net migration rising to 243,000 from 175,000 the previous year, way over the totemic 100,000 figure targeted by Conservative ministers. It is also interesting to note that the decline in non-EU migration (the part the Government can control) seems to have stopped. The latest estimates for the year ending suggest that 265,000 non-EU citizens immigrating to the UK, a slight increase but not a statistically significant change, from 246,000 in the previous year. Net migration of non-EU citizens increased from an estimated 145,000 in the year ending March 2013 to 162,000 in the year ending March 2014. These estimates show that 54%, 30% and 14% of total EU immigration was accounted for by citizens of the EU15 (the 'old' EU member states), EU8 (central and eastern member states that joined in 2004) and EU2 (Bulgaria and Romania) respectively. Overall net migration of EU citizens was 131,000, a statistically significant increase compared to 95,000 in the previous year. This highlights, once again, that a large part of the recent increase in EU migration is being driven by migration from the more established EU member states, presumably a large number of them looking for an alternative to the high levels of unemployment in the countries worst affected by the eurozone crisis. In contrast, migration from the 2004 accession states has been relatively stable. Net migration from these countries was 41,000, not a statistically significant increase compared to the 34,000 in the previous year. For Bulgaria and Romania, it looks as though the ending of transitional controls on access to the UK labour market in January 2014 could have had some impact with a 12,000 increase in migration on the previous year (although we should be careful since this data mostly reflects 2013), and almost 80% of EU2 citizens arriving for work-related reasons. Yesterday saw the German government announce tough new domestic rules on EU migrants' access to benefits, which closely mirror those announced by David Cameron late last month. Downing Street has welcomed the German proposals and added, "Clearly there is now a case for looking at other things we want to do where we may need to change the [EU] rules". The question now is whether Cameron can muster enough European support to change the EU rules in this area sufficiently to satisfy public and political opinion in Britain. Jean-Claude Juncker and his people have rightly expressed concern over the lack of female European Commission candidates put forward by member states. It’s raining men in Brussels as we put it recently. Never slow to jump on a bandwagon, certain MEPs are now digging in as well, threatening a veto (remember the European Parliament has to approve the new Commission) should Juncker’s Commission not include enough women. "The European Parliament is very concerned that at present virtually all the potential candidates whose names are circulating are men. The European Parliament will not accept a gentlemen’s club." "As liberals, we cannot support a commission with too few women." 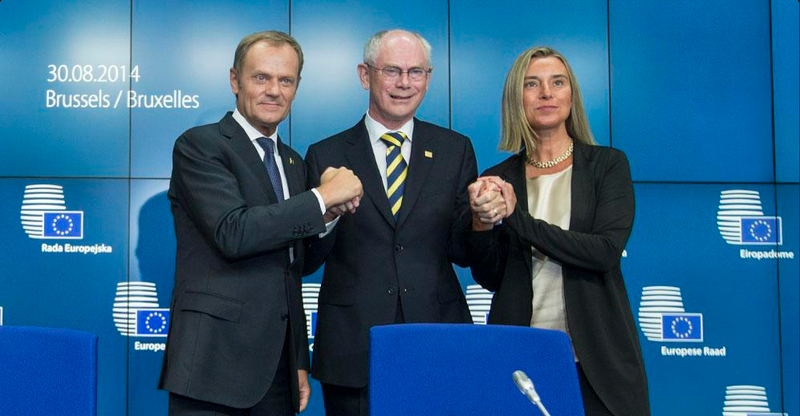 "We will not support a European Commission with fewer women than today." So whilst not exactly Whites or the East India Club – hardly a great beacon of gender balance either. As that old saying goes, start with the man (errr) in the mirror. The Swedish elections take place on 14 September. As polls stand, the sitting centre-right coalition government, "Alliansen" - the Moderates, Centre Party, People's Party and Christian Democrats - look set to lose to a leftist coalition of some sort. The big question might be who the Social Democrats - the biggest party in the polls - decide to rule with: the Green Party is the most likely partner, but the Left Party could be in the mix too. There's even talk of the Social Democrats reaching across the aisle to form some sort of 'grand coalition' - which would break with tradition. It may not be that easy for the Social Democrats to agree economic policy with the Greens and Far Left, both of which are, well, pretty far to the left. In the latest Ipsos poll, the three left parties together muster 50.4%, whilst Alliansen is on only on 35.6%. A poll of polls for daily Expressen has a slightly stronger showing for the centre-right but the broad picture remains the same: absent an upset, Sweden looks set for a centre-left government following eight years of centre-right rule. 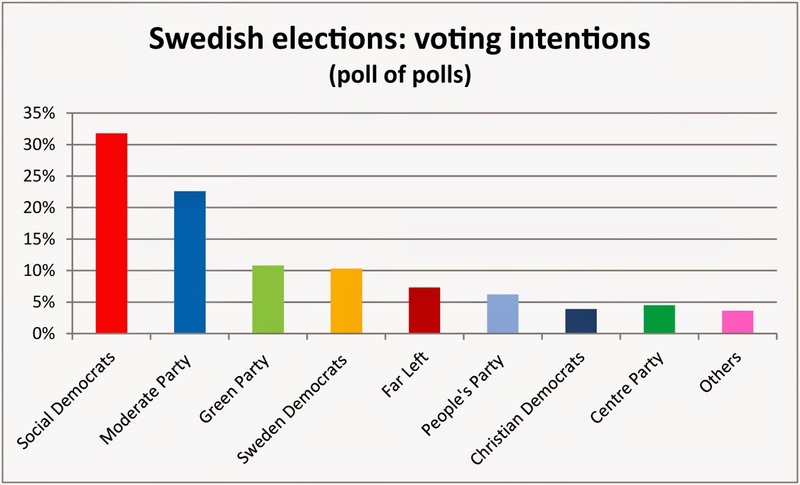 At the same time, the anti-immigration Sweden Democrats have gained steadily in the polls, and it is now the fourth most popular party in the country on 10.3% (it made the Parliament for the first time in 2010, on 5.7%) according to the poll of polls - breathing down the neck of the Greens, on 10.8%. This despite Swedish media really having turned up the heat on the party over the last few years - often deserved but at times hysterically and counter-productively (the Swedish establishment hasn't quite yet grasped the 'metropolitan elite is ganging up on us' narrative that is doing so much for anti-establishment parties across Europe). That's worrying news for those of us who want Sweden to remain a liberal and outward-looking country. 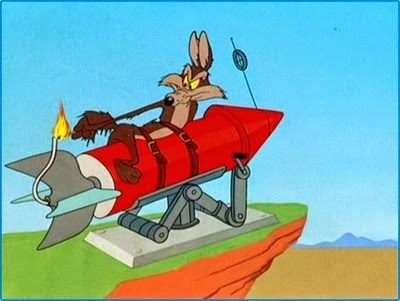 This week has seen the latest farcical episode in the EU's foray into space. The independent European Space Agency (ESA), which is based in Paris and is building the so-called Galileo satellite navigation system for the EU, was left with egg on its face after the two latest satellites for the system were launched into the 'wrong' orbit. In total, the project has now launched six satellites - two are in the wrong orbit and one, it emerged previously this year, isn't working. Bad in its own right, but forgivable. We're dealing with some pretty advanced technology after all. Except, as we have chronicled before, this project has been absolutely bedeviled by unfortunate incidents, delays, infighting, poor planning and all sorts of other problems. The Commission all over the place on numbers: In 2010, Industry Commissioner Antonio Tajani denied new cost over-runs, saying “I don't know where these figures come from.” He insisted that the deployment budget (which is only part of the cost) remained at €3.4 billion (not €5 billion as the leaked info suggested). Only a few months later, in January 2011, however, Mr. Tajani and the Commission admitted that Galileo needed not just another €1.5-1.7 billion as was thought in 2010, but an extra €1.9 billion of taxpayers’ cash to cover the booming deployment cost – taking the deployment cost above €5 billion. At the same time, the Commission put the annual operation cost at €800 million (not €750 million as assumed in the 2010 estimate). This means that even €22.2 billion for deployments and running cost was an under-estimate. Tajani has since announced what he calls “savings” of some €500 million on the huge cost overrun, but frankly, at this point we simply don’t trust any of the numbers coming out of the Commission on this one. Taxpayers getting hammered: The cost for taxpayers for deployment plus 20 years’ worth of running cost may well have increased by some 750% - from €2.6 billion to somewhere in the region of €20 billion+. Shocking. Delays: Originally Galileo was to be finished by 2008 – a date that was subsequently pushed back several times due to a series of delays, disruptions and other embarrassments. Between July 2005 and December 2005, the project came to a complete halt as member states and the private investors argued. According to the European Court of Auditors, these six months of doing absolutely nothing added an extra €103 million to the cost of the project. Encouragingly, the project managed to make up some time and the satellites were launched this year. However, with only three of the four previously launched working and this latest setback, the performance of this project leaves a lot to be desired to say the least. Public-private partnership flawed from the very start: As the European Court of Auditors concluded in a damning investigation, the original public-private partnership proposal was “unrealistic” and “inadequately prepared and conceived.” Symptomatically, the private investors withdrew due to fears over the cost of the project spiralling “out of control” and that they wouldn't outweigh the benefits. The Indian, Chinese, Russian, Japanese, American markets already crowded: One of the reasons why the idea of “3 billion users” is so ridiculous is that all major players already have, or are in the process of acquiring, their own satellite navigation systems. The newly-redeveloped Russian “GLONASS” system has already been launched, and the Chinese are developing their own Compass/Beidou system (not a global endeavour, but set to deprive Galileo of revenue in China). India’s equivalent technology, IRNSS, will be operational within the next two years. Japan has one too and the US is soon to boast a new generation GPS System (though to be fair, that too seems to be delayed) – GPS being what most people happily use in Europe anyway. Where in the world is Galileo going to get its 3 billion users? Is there a better of example of how the EU is falling behind in the 'global race'? The Chinese have nicked the frequency: In 2003, China agreed to invest €230 million in the project but pulled out after disagreements. Lo and behold, the Europeans noted that the Chinese government was a little too interested in the security related aspects of the project, and got cold feet. But only after Beijing got its hands on some very useful information. So while Galileo was falling behind schedule, the Chinese were developing Compass/Beidou. Chinese officials told the International Telecommunications Union, the United Nations agency that allocates radio spectrum frequencies for satellite use, that China plans to transmit signals on the wavelength that the EU wants to use for Galileo. In other words, the EU is now in the absurd position of having to ask China's permission to run its secure 'encrypted' signal on Chinese frequencies. The SNP embraces EU reform - but is it trying to have it both ways on treaty change? "the Scottish Government considers that greater observance of the principle of subsidiarity, is one of the key means of maintaining the democratic legitimacy of the EU… it is essential that the procedure for monitoring subsidiarity by national parliaments is extended further to give an enhanced role for both sub-national and local parliaments." Cutting red tape and EU "competence creep"
"the volume and complexity of the EU regulation affecting businesses in Scotland can pose a significant administrative and financial burden on them (particularly SMEs) and is threatening their ability to recover from the economic and financial crisis." An increased review of legislation which is no longer appropriate for today’s climate. The above are good suggestions - indeed ones which Open Europe has been advocating for a while now (see our 2011 report on European localism and our 2010 report on EU over-regulation for example) but as always, the question is how to translate this into practice. Still, the report has some pretty big gaps - for example, it barely mentions the EU budget despite this being in radical need of reform (for example, contrary to common perceptions, Scotland would benefit from devolving regional subsidies back to the national level). Likewise beyond some general praise for EU free movement, the report does not discuss whether changes are needed to rules around EU migrants' access to benefits. In some places, the report calls for more protectionist measures at the EU level, such as amending procurement laws to ensure that contractors to pay the living as opposed to the minimum wage. 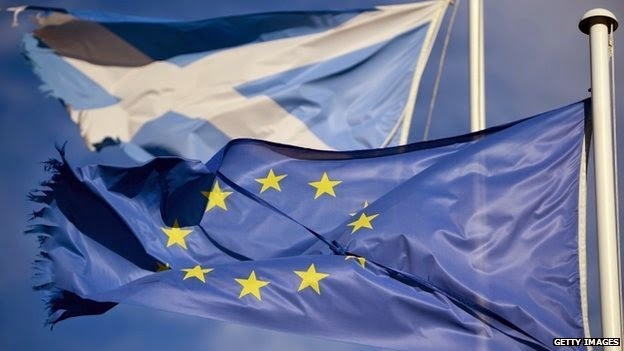 The SNP is also keen to distance itself from David Cameron's EU policies and says that changing the EU Treaties is "neither necessary nor desirable". The party claims that its reforms can be accommodated within the existing Treaties. Whatever the rights and wrongs, this is slightly ironic given that Scotland's potential accession to the EU as an independent country rests squarely on the EU Treaties being opened and changed: not only the accession itself (to which all other member states would have to agree) but also to get the opt-outs from the euro and Schengen that the SNP says it wants. It's also ironic since if SNP has its way, it could deliver the kind of opening of the Treaties that the Tories are hoping for. The Times yesterday noted that pressure among some senior Tories is building on David Cameron to prioritise the negotiation of 'curbs' on the free movement of persons. The word 'curb' is used often in this debate, but it is not always clear what it is that people are demanding be 'curbed'. There are essentially two issues here: one about fairness - fair, sound and transparent rules around who can access what benefits and when. 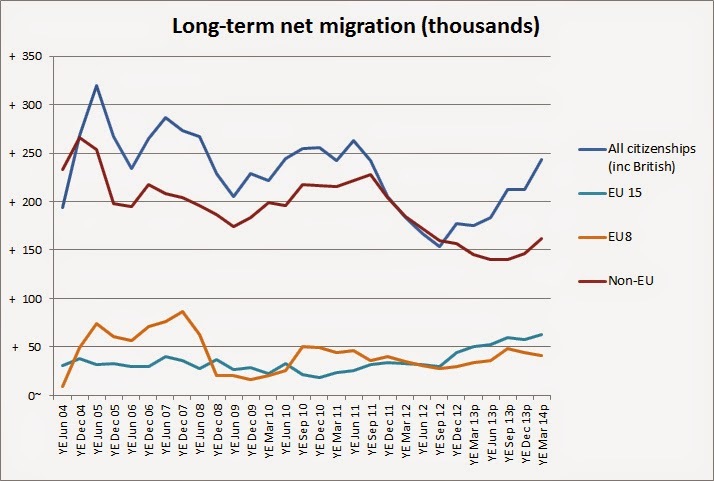 And one about the level of EU migration - volume. The first is what David Cameron and Downing Street have been trying to address by tightening EU migrants' access to out of work benefits. As we've noted before, more could certainly be achieved through amending legislation at the EU level. Other issues that arguably fall into this category are access to the UK's system in-work benefits, such as working tax credits, which are meant help to boost incomes at the lower end of the labour market and ease the transition from out of work benefits. However, the UK is currently unable to regulate EU migrants' access to these under the EU's current non-discrimination rules and the definitions of an 'EU worker' set down by EU courts. This is another area that could potentially be addressed to some degree by amending secondary legislation. But what is clear is that an increasing number of Tory 'big beasts' - Iain Duncan Smith, Theresa May and Boris Johnson - are looking to address the second issue: public concerns about the volume of EU migrants (the latest stats showed a marked increase in the number of central and eastern EU workers). This is a much taller ask and would almost certainly require treaty change and therefore unanimity. This does not make it entirely impossible but certainly more difficult than addressing concerns about fairness. Remember, this involves amending one for the most fundamental principles of the EU treaties. Another massive question is how, exactly, strengthened control over the volume of EU migration could work in practice. There have already been suggestions that the Home Office is considering options that fall under this category. 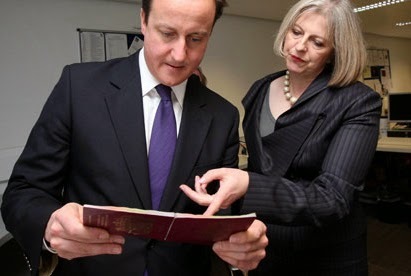 In May 2012, at the height of the Greek social and economic crisis, it was reported that Theresa May was looking at whether emergency immigration controls could be applied if required by exceptional circumstances. Another proposal, put forward by David Goodhart, is that governments should be able to introduce qualifications or restrictions on free movement "if the EU inflow breaches a cap of, say, 75,000 in a single year". In any case, this will be a key debate within Tory ranks leading up to the potential 2017 EU referendum. Fact check: Can we take Danny Alexander's "3 million jobs" threat seriously? "The Treasury estimates that 3 million jobs in the UK are linked, directly and indirectly, to the export of goods and services to the European Union. This figure is based on the assumption that the share of total UK employment associated with UK exports to the EU is equal to the share of total UK value added (GVA) generated by UK exports to the EU. The information necessary to apply the same method to derive comparable estimates for England, Scotland, Wales and Northern Ireland is not available." "The estimate of 3.5 million jobs linked to trade with the European Union is based on the assumption that the share of UK employment linked to trade with the EU is equal to the share of total UK value added (GDP) generated in the production of goods and services exported to the EU." "The calculation uses data from UK Input-Output tables to estimate the proportion of UK value-added content generated in exports of goods and services and applies this to the values of UK exports to the EU. This is then divided by total UK GDP and the resultant proportion then applied to the total UK labour force to estimate the proportion of the labour force linked to EU exports on a value-added basis." In short, the methodology dates back more than ten years and does not seem to have been updated at all. 2. Perhaps most crucially, as the Treasury's response makes clear, this study "is not an estimate of the impact of EU membership on employment." So it is rather misleading, to say the least, of Mr Alexander to suggest that these jobs are at "risk". To say that X number of jobs are linked (directly or indirectly) to exports to the EU is clearly not the same thing as suggesting that they are dependent on EU membership. To be fair to Mr Alexander the Treasury's position on this is somewhat confused itself - it claims that this is not an estimate of the impact of EU membership on employment, however, that is exactly what the simplistic calculation and, importantly, its flawed counterfactual seem to suggest (see below). A flawed counter-factual: We have always stressed the importance of the counter-factual when assessing the future of the EU/UK relationship. The counter-factual here is essentially that these jobs would not exist without the EU. This is odd for at least two reasons: first, it effectively assumes an end to all exports to Europe should the UK withdraw from the EU. We can argue about the level of market access a post-Brexit UK may be granted (we've done a lot of work on this) but one thing is clear: there will be exports from the UK to the EU under any scenario. Secondly, by definition the analysis assumes that all value added by jobs related to EU exports would not exist without the EU membership. A simple common sense check suggests that, actually many of these jobs may still produce some value even if the goods did not find their way to the EU and that the resources could be alternatively employed. Assumes productivity is the same across the UK economy: While it is claimed that the calculation "takes account of the composition of the UK economy" it is not clear exactly how this is done. On the surface the calculation also seems to implicitly assume that labour productivity (broadly output per worker or per hour) is the same across the entire economy (by saying the basic proportion of output corresponds to the same proportion of employment). Fundamentally we know this is not true - on the most basic level, we know that skilled and unskilled jobs will have different productivity levels. A quick glance at the most recent ONS labour productivity statistics confirms this and highlights that over the decade since this methodology was created, different sectors' and regions' productivity rates have grown in different ways. Unless this is accounted for in a detailed way in the methodology it is likely to distort the figure. The final point above suggests that there is either some continuing lack of transparency with regards to the calculation or it really is just overly simplistic (if not both). This is all quite ironic given that UKIP and Better Off Outers in general are often criticised - and often justifiably so - for not establishing a credible counter-factual whilst relying on heroic assumptions. Mr Alexander should know better. In total, there were around 820,000 more people employed in the UK than a year earlier, of which around 500,000 were UK born and 327,000 were non-UK born. Of the non-UK born, 187,000 were from the EU and 140,000 from non-EU countries. The number of Bulgarian and Romanian born people employed in the UK stood at 153,000, up by 13,000 from the same period last year (a 9% increase), before transitional labour market controls were lifted. However, the numbers from other central and eastern European countries increased far more dramatically to 861,000, up by 178,000 from last year (a 26% increase). The number of migrants from the ‘old’ EU member states fell by 9,000 (a 1.2% decrease). This is only one set of data and refer only to employment (not the same as migration figures, the latest batch of which will be released later this month), and it will be interesting to see how the figures match up. The chart above breaks down the share of EU born employed and shows that the group responsible for the biggest increase is the central and eastern European countries that joined the EU in 2004. The Romanian and Bulgarian share is up a little but, as we noted before, there has not been a major change since the lifting of transitional controls on 1 January 2014. Interestingly, the number of people employed from the 'old' EU 14 states has dropped slightly - the number of migrants from this group had been increasing as a result of the eurozone crisis. Is this a sign that this trend is slowing or reversing? German 'crackdown' on EU citizens’ access to benefits: what does it involve? The issue of how to balance EU free movement and the rights of member states to control their welfare systems has been a long running issue, one which several countries (not only the UK) are struggling with. We've previously reported about how the influx of EU migrants has caused problems in Germany, prompting the grand coalition to commission a review into the issue. Limiting the period in which EU citizens can be registered as jobseekers to six months, after which they are obliged to leave the country if they are still unemployed. This is similar to the UK's current approach, although David Cameron announced last month that this would be toughened. Banning any EU citizens found guilty of “abusing or defrauding” the German welfare system from re-entering Germany for a period of five years. How easy this will be to enforce in the Schengen border-free zone is questionable. Making it harder to export child benefit abroad by demanding additional documentation and changing domestic taxation rules. David Cameron has also made this a priority and it remains unclear whether limiting payments to working migrants' children who live abroad is permissible under EU law. 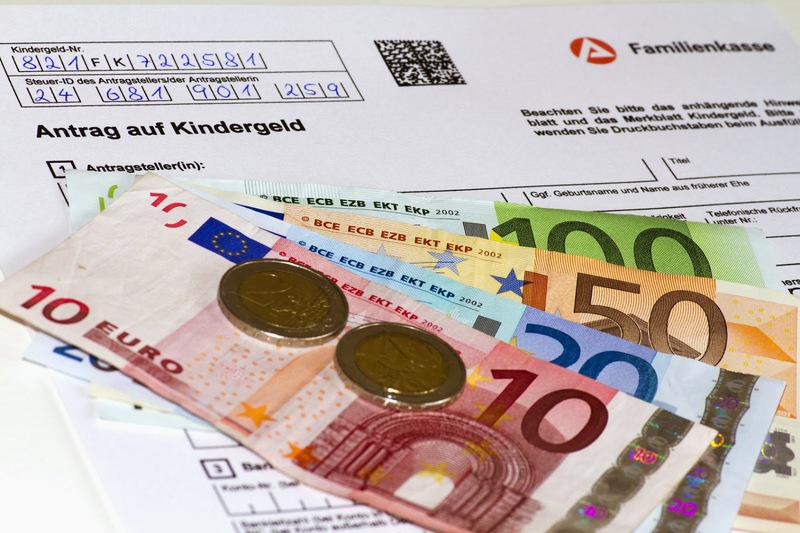 In addition, German municipalities are to get additional financial assistance from the government to cope with the effects of an influx of migrants to help cope with extra pressures on local services. This 'crackdown' comes at an interesting time for two reasons. Firstly, today's Bild reports, according to new figures from the German Federal Employment Agency, the number of EU citizens from Greece, Spain, Portugal, Italy and the ten Central and Eastern European member states claiming unemployment benefits in Germany has for the first time exceeded 300,000 after going up by 53,216 (21.6%) in April compared with April 2013. Secondly, confidence in the German economy is on the decrease which could add political momentum to those who want to further restrict free movement. Renzi may be able to muster wider parliamentary support than [his predecessor Enrico] Letta, but he would still be stuck with a diverse coalition with smaller centrist and centre-right parties – meaning that the difficulties in pushing ahead any significant political and/or economic reform would not evaporate. Others have been announced but have yet to be turned into an official legislative proposal (such as the reform of the judiciary). 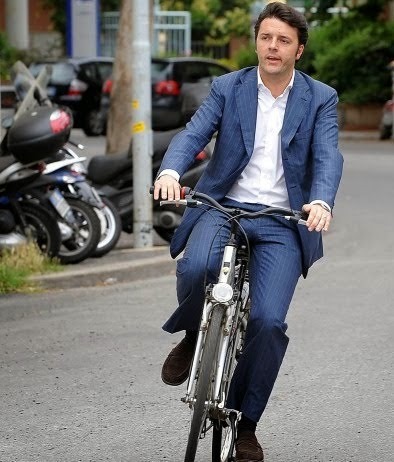 To be fair to Renzi, his reform plans involve changes Italy has failed to make for decades. However, there is little doubt the pressure is slowly mounting on the ambitious Italian Prime Minister - especially in light of the latest daunting economic data. Italy has entered recession again. Its GDP contracted by 0.2% in the second quarter of 2014 - worse than expected. The country's national statistics office ISTAT now expects Italian GDP to shrink by 0.3% this year, unless the trend is reversed. This is nowhere near the 0.8% GDP growth initially predicted by Renzi's government. By contrast, Spain is going to upgrade its growth forecast to +1.5% and +2% for 2014 and 2015 respectively. Needless to say, the meagre growth prospects are raising questions in Brussels, Berlin and Frankfurt over Italy's ability to keep its deficit below the 'magic' EU threshold of 3% of GDP and start reducing its mountain of public debt. Unless Renzi can show substantial progress on the reform side, he's unlikely to achieve any of the 'flexibility' on the application of EU fiscal rules that he's been demanding - along with French President François Hollande - over the past few weeks, and may find himself left with little wiggle room. This would set the scene for another political stand-off between the core and periphery of the eurozone - a scenario which few emerge from looking good. Perhaps more worryingly, Renzi seems to be currently focusing too much of his reform efforts on the political-institutional side. The reform of the Italian Senate - which has recently taken the centre stage in Rome - is of great symbolic importance and will help speed up the decision-making process once (and if) passed. But its economic impact is limited, and it involves changing the Constitution, meaning that it may not be finalised until early 2015 and will then also be put to a referendum - whose outcome cannot be taken for granted at this stage. Italy can only benefit from the removal of the institutional blockages stemming from a system where the two chambers of parliament have equal powers. However, Italy's economic situation means Renzi should consider investing his best energy and political capital elsewhere - not least because economic reform is the key area where his EU counterparts wish to see progress. On the economic front, the main achievement of Renzi's government to date is probably a tax cut worth €80 a month for employees earning less than €25,000 a year. The measure may have played a part in Renzi's Democratic Party winning an outstanding 40.8% of votes at the European Parliament elections in May - but the jury is still out as regards its effectiveness as a means to boost domestic demand. Furthermore, uncertainty remains over Italy's plans to cut public spending and use the savings to finance tax cuts for workers and businesses. Carlo Cottarelli, the Italian government's special commissioner for public spending reform, has recently warned on his blog that the resources he's expected to raise via spending cuts next year are already being used to fund new spending projects. In practice, this means less money to cut the tax burden on Italian businesses and workers - which is among the highest in the world and has been identified as a key pillar of economic reform. Predictably, Renzi was off to a strong start in terms of trust from both Italian voters and Italy's European partners. However, the time may have come for him to re-focus his priorities and push harder on economic reform. A more efficient parliamentary system and electoral law, while very necessary, will do little to help him win any meaningful concessions in Europe. A thriving economy that grows at an acceptable pace will. If you read our press summary, you will have noticed that the debate around the US-EU free trade deal (TTIP) is really picking up in Germany, with even the euro-critical AfD coming out against key elements of the deal ahead of the European elections. Of all the mainstream newspapers in Europe, Süddeutsche Zeitung is the one that has devoted the most time and effort into covering the on-going negotiations over TTIP, and it has also published a number of comment pieces - both for and against. "European governments can escape the impasse by making it clear that they want to expand free trade via the TTIP principle while at the same time meeting the legitimate concerns of their citizens who do not want increased prosperity at the cost of losing environmental and health standards. GM foods? Only after passing the European approval procedure and with clear labeling. Investor lawsuits against environmental legislation such as Vattenfall’s legal challenge against the nuclear phase-out? Not before secret tribunals, but only in the ordinary courts." German public opinion will be a crucial factor in determining the success or failure of the TTIP negotiations. 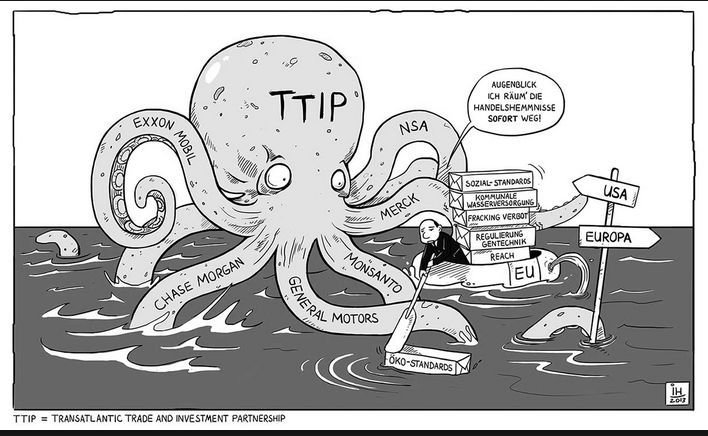 As with everything else these days, we suspect, on TTIP, as goes Germany, so goes Europe. An Infratest Dimap poll for Welt/ARD published today showed that 70% of Germans are in favour of the EU's response to the crisis, with 80% thinking that Russia bears the biggest responsibility for the break-down in relations between Russia and the West, and with a slim majority (49% vs 46%) in favour tightening sanctions further, even if it has a negative impact on the German economy and jobs. Being as ever nervous about meddling too much in world affairs, there's been a considerable shift in the German media and public-opinion regarding Russia. In March, after the annexation of Crimea, only 38% supported economic sanctions. By May this had risen to 50%. Now it's at 70%. The volte-face can be explained in part by some industry bodies publicly announcing that they would be able to weather such sanctions and the public outcry over the MH17 tragedy. As has been noted by others, Angela Merkel was absolutely instrumental in breaking the deadlock over the sanctions, by showing willingness for Germany to bear a large chunk of the costs. This probably wouldn't have been possible absent the shift in public opinion (incidentally also illustrating how the "as Germany goes, so goes Europe" rule now increasingly also applies to foreign policy). "With its politics of escalation, Europe is missing a realistic [end] goal... Even the aim to bring Russia to its knees through economic pressure and political isolation, has not been properly thought through." "Even if this were to work: What good will that do? How can one expect to live alongside a demeaned people in the European house, when their elected-leader is treated like pariah, and their citizens may be committed to soup-kitchens in the coming winter?" 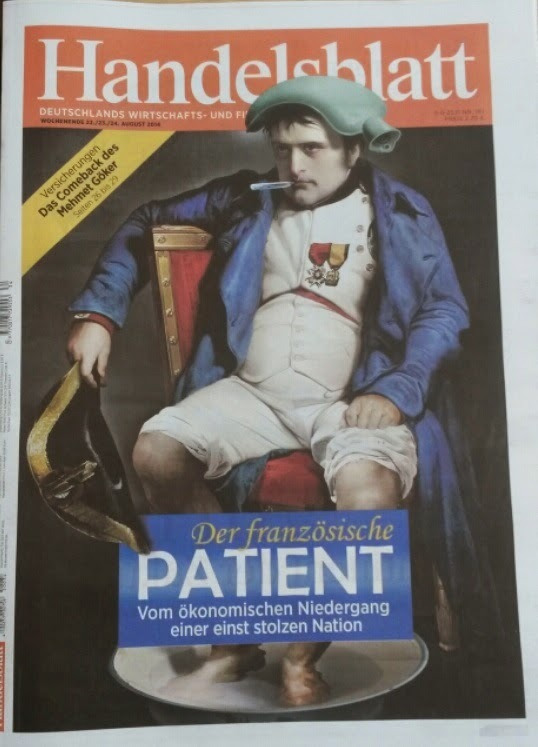 "German journalism has switched from level-headed to agitated in a matter of weeks. The spectrum of opinions has narrowed to that of a sniper's scope... Headlines betray an aggressive tone that is usually characteristic of football hooligans." 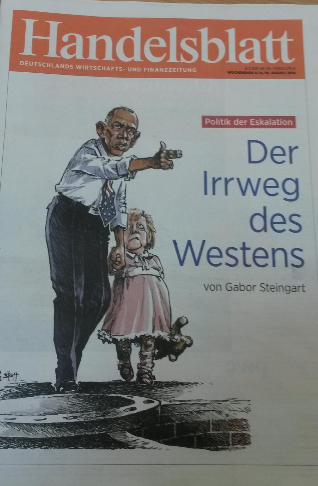 There is clearly a growing gap in the German media, politics and public between those who want to go in harder on Putin, and those who favour Germany's 'Ostpolitik' tradition of bridge-building with the Kremlin. In turn, this reflects that on-going, grinding and drawn-out debate about Germany's role in Europe and the wider world, in which all kinds of German instincts clash. As we noted in an earlier post, London Mayor Boris Johnson's intervention on the UK's future relationship with the EU set out a list of policy objectives that go well beyond what David Cameron has so far proposed. They noticeably set the bar higher for any successful renegotiation. Make progress on the single market in services: The report for the Mayor cites Open Europe's research which illustrates that an ambitious liberalisation of cross-border trade in services could boost EU GDP by 2.3%. This is in fact a call for free trade that could boost competitiveness across the EU - the UK should push this policy hard and, if others aren't willing to agree en masse, be prepared to lead a vanguard of countries who are. Better protection for the City of London from intrusive financial services regulation: A long-standing concern for us. We have noted that, since the eurozone crisis, the EU's regulatory output in this area has become far more trade-restricting and items such as the FTT were outright hostile to the City of London. This ties into the eurozone/non-eurozone point below, and why mechanisms to ensure that the single market cannot be controlled by the eurozone-bloc are essential to the UK's interests. Reform the relationship between euro ins and outs: This is arguably the biggest strategic issue facing the UK in Europe - and the report goes into far more detail on this than Boris did in his speech. The UK will not be able to live within an EU dominated by the eurozone. The ad-hoc solution used in the European Banking Authority of so-called 'double majority voting', which we were the first to propose, illustrates that this can be addressed but how easily this model can be replicated elsewhere is debatable and other solutions will be needed. A 'red card' for national parliaments: Again, a policy we have long championed. This is something that has support in several member states and would if member states and the Commission are serious about respecting it, root EU policy making more firmly in the hands of those with most democratic legitimacy in Europe - national MPs. A return to intergovernmental cooperation in justice and home affairs, outside the jurisdiction of the EU: We have long argued that the ECJ should not have jurisdiction over crime and policing law as it applies to the UK and that the UK should seek a return to intergovernmental cooperation that does not cede democratic control over such a sensitive area. 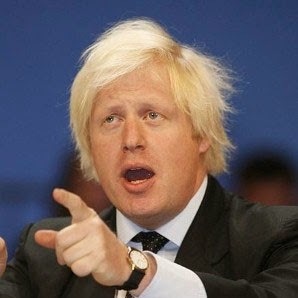 Reforming social and employment law: Boris talked of minimising "the costs to all EU businesses", but also said that if this meant resurrecting the UK's social policy opt-out, "I don’t think it will be a bad thing." We have calculated that EU social law currently costs UK business and the public sector £8.6bn a year - a figure also cited by Boris in his speech - and while these costs would not magically disappear if this area was left to national governments, there would be far more flexibility to tailor rules to local needs and practises - i.e. 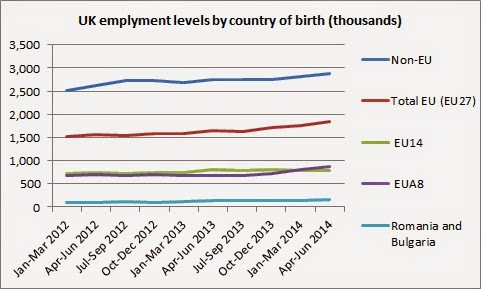 the UK's flexible labour market. On free movement of people, Boris called for "managed migration": Here Boris went further than Gerard's report. Boris seems to be calling for the principle of free movement to be revisited. It's not entirely clear what he means but we have long argued that EU migration can provide benefits to the UK and EU economy but that reform is certainly needed to the rules around access benefits for EU migrants. This means far more discretion for national governments over who can access state welfare and public services and on what terms. However, we do think the principle of free movement of workers - as originally intended - should remain. Halting 'ever closer union': Often dismissed as a symbolic change, in fact this is about changing the culture of the EU and the default position that centralisation is always good. It is about instilling the principle that not all member states want to head in the same direction and that powers should be able to move downwards from Brussels to national capitals. This is a reform agenda that would indeed radically reform the EU and the UK's relationship with it. As we have noted elsewhere, if there is a referendum in 2017, the British public will be far better placed than in 1975 to decide if the change is enough to vote for and that is why the stakes are now so high. As we also have noted, however, the big challenge will be the timetable. Will this be possible before 2017? What will the impact of the Russian retaliatory sanctions be? Russia earlier unveiled the key plank of its retaliation against the ‘stage three’ EU sanctions confirmed last week. It has said that it will now ban all imports of fruit, veg, meat (including fish) and dairy products from the EU (as well as the US, Australia, Canada and Norway). How will this impact Europe? 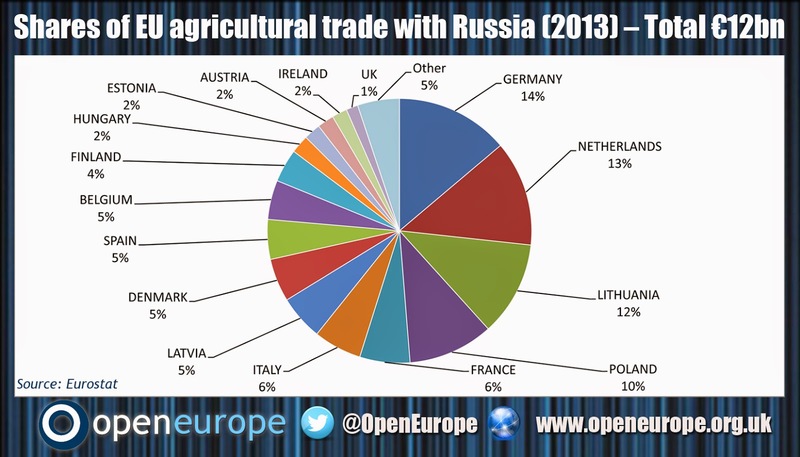 This helpful factsheet gives an idea of the overall level of EU agricultural exports to Russia. As the box above shows, agricultural exports are about 7% of total EU exports. Of this, 10% goes to Russia. This means that agricultural exports account for around 0.7% of overall EU exports – it’s important to remember that this figure includes much more than the specific parts targeted in the sanctions. In terms of specific countries, the chart below highlights that the Baltic countries (Latvia, Lithuania and Estonia) will be hardest hit – in terms of the trade as a share of GDP. In absolute terms, Poland, the Netherlands, Germany and Denmark will also face losses. How will this impact Russia? Well, as has already been pointed out, the likely fallout will be higher prices for Russian consumers (driving up inflation more broadly) and reduced consumer choice. 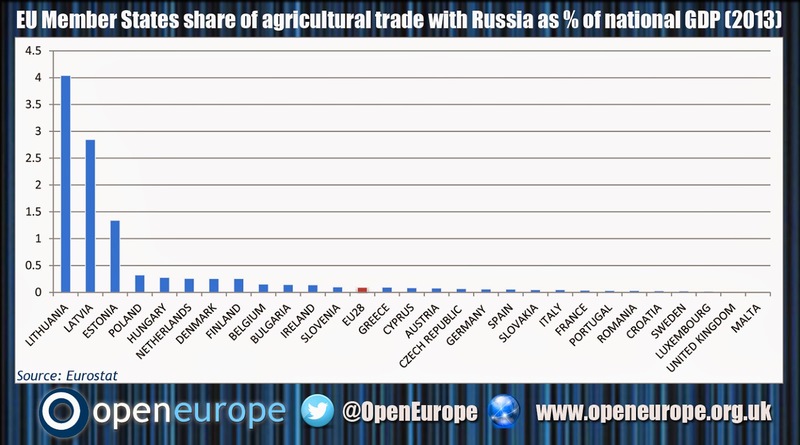 As we pointed out previously, Russia does import some agricultural products but only to the tune of around 1.2% GDP per year. This is dwarfed by some of its other imports. Expand domestic production. Not impossible given the natural resources and land at Russia’s disposal as well as the state’s resources (although these could take a hit from the escalating sanctions). In terms of security this has long been on Russia’s list of things to move towards. Expand production with Eurasian partners. As part of its ongoing response to the crisis Russia is deepening links with surrounding states and specifically members of the fledgling Eurasian Union. Some of these states will have significant agricultural sectors, although they will unlikely be quickly able to help supply a country the size of Russia. Look farther afield. Rumours of Russia trying to strike agricultural deals with Latin America abound, while (as is always the case these days) Russia will likely look to China for support. This would obviously undermine any attempt to increase food security, however, would help limit the economic impact. Does this set the scene for a broader trade war? Hopefully, not yet. The sanctions on both sides remain quite targeted and specific. That said, it’s hard to see how either side could easily change position. That is feeding into a broader feeling of unease when it comes to the private sectors of both sides doing business together. This indirect or de facto halting of trade is likely to be the largest negative effect from this escalation. Boris Johnson today outlined his response to the report by his economic advisor - and Open Europe board member - Dr Gerard Lyons on the future of the UK’s relations with the EU and how they impact on London. The best scenario is UK membership of a reformed EU, which could see London’s economy grow in size from £350 billion now to £640 billion over the next 20 years. The worst scenario would be where the UK leaves the EU on bad terms and does not produce a growth-focused policy. The report suggests the London economy would only grow to £430 billion by 2034 in this scenario, and see a shedding of about 1.2 million jobs. If the UK left the EU, maintained good relations with the EU and adopted outward-looking policies, then the London economy would grow to £615 billion and see an additional 900,000 jobs created over the next 20 years. This is despite the near-term uncertainty that would follow from leaving. Being in an unreformed EU, London might see only an extra 200,000 jobs created and growth to £495 billion over two decades. The key reforms - which draw heavily from Open Europe's work - proposed in the report are: addressing the relationship between euro ins and outs, liberalising the single market in services, safeguards on the single market in financial services and the position of the City of London, EU budget reform, reducing the burden of social and employment law, and halting over-regulation. The reforms go well beyond what David Cameron has set out so far. If reform is not sufficient, the report concedes that withdrawal would create immediate economic uncertainty but this could be mitigated in the longer term if the right policies are pursued. The report suggests that the terms of a Brexit could be defined by the referendum result itself - a close result could prompt a re-re-negotiation rather than an immediate reach for the Article 50 exit clause - you can read the outcome of our 'wargaming' of Brexit here (which the report also references). The report notes that financial services and insurance are key London industries, comprising 19.8% of GVA, the single biggest sector measured in these terms – how will this be affected in Brexit? The report notes that London has many attributes other than acting as a springboard for access to EU markets but adds that this market access is valuable and could face some extra barriers following withdrawal. In summary, the report concludes that reform is the best option, but there is little to fear from Brexit.That last point - in addition, to the various reform proposals set out - will no doubt serve to put additional pressure on David Cameron to be more ambitious in his push. Well, courtesy of European Voice, we now learn that the final turnout figure has been revised down to 42.54% – i.e. the lowest turnout ever. The 43.09% figure was based on exit polls so was preliminary, and it has taken a month and half to establish the real figures. 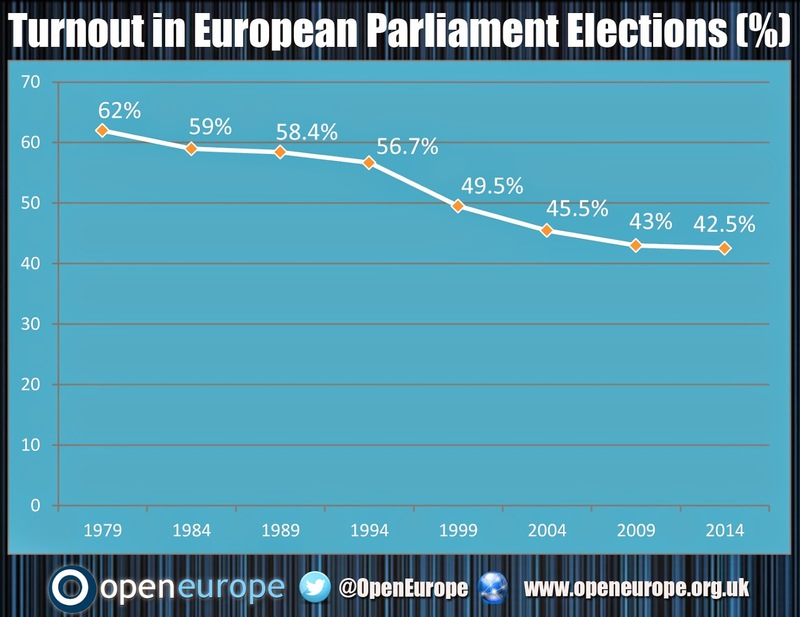 So it’s official: voter turnout has dropped in every single European elections since 1979, whilst the EP’s powers have consistently increased. It’ll be interesting to see how the usual suspects try to spin this one. This isn’t a cause for celebration. It’s just simply embarrassing. What will the impact of stage three sanctions be and how might Russia retaliate? Over the weekend we published a new flash analysis looking primarily at the impact of the financial sanctions on Russia and what action Russia could take in retaliation. The key points are below with some key graphs, while the full release is here. Impact on Europe: UK to bear the largest burden. 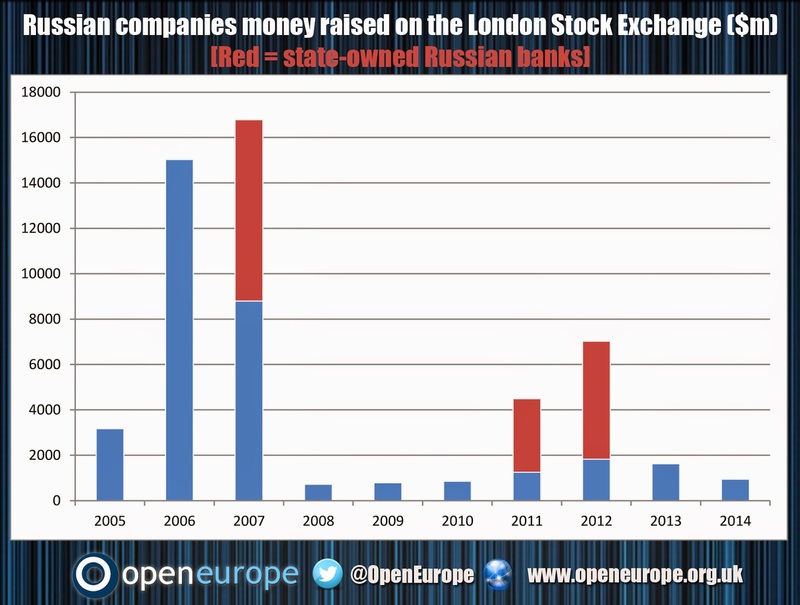 Between 2004 and 2012 Russian firms raised $49bn on the London Stock Exchange (LSE), of which $16.4bn was raised by state-owned Russian banks (Sberbank and VTB). The burden will be manageable since revenue from financial services to Russian firms’ accounts for only 1% of UK exports in this area. Impact on Russia: State-owned banks such as VTB and Gazprom have to rollover at least $6bn worth of foreign currency debt in the next 18 months – funding costs will be increased but other markets likely to remain open. Indirect impact will be much larger as reluctance to do business with Russian firms or in Russia increases. 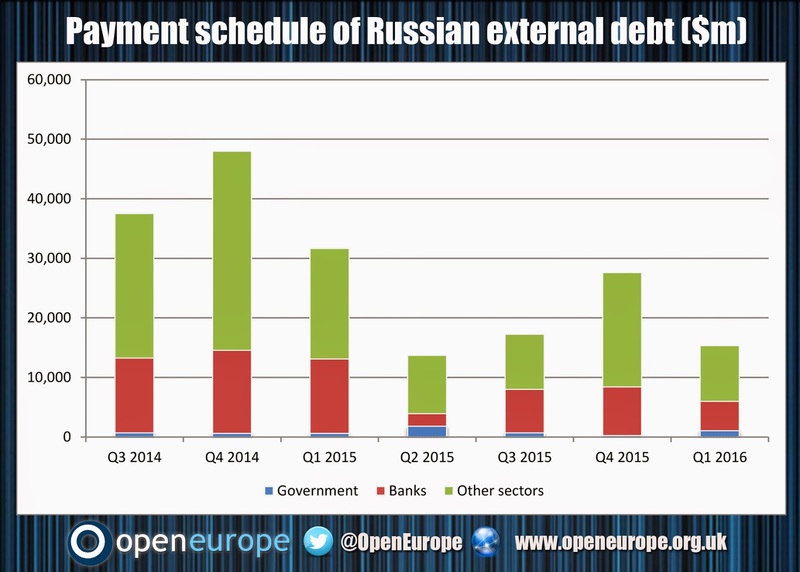 Russian entities have $85.4bn in external debt to rollover in the rest of 2014 alone, while capital outflows have totalled $75bn in the past 6 months alone. The Russian economy could find itself short of credit and liquidity, although its sizeable international reserves ($478bn) will help. Russian retaliation: Russia will likely further alienate the Ukrainian economy and destabilise the situation on the ground. This could prompt Ukraine to request a further bailout from the West, totalling double digit billions. Russia could also respond with its own sanctions on Western firms and may even consider asset freezes or seizures. Further escalation could also see Russia leverage its position as Europe’s main gas supplier – either through price hikes or disrupting transit through Ukraine – to hurt the EU economy. More broadly the sanctions will hit other countries, primarily Germany. While German business will be hit directly by sanctions on exports of high tech goods in the oil sector, the much larger impact will be indirect. Declining business between European and Russia will likely hurt Germany since it has the largest level of trade with Russia and one of the more closely linked economies. This will likely be another test for Germany’s ability to diversify its exports, as it has proven to be so adept at doing during the eurozone crisis. For better or worse, without the UK and Germany showing a willingness to stomach the cost of these sanctions, it seems unlikely that a deal would have been reached.